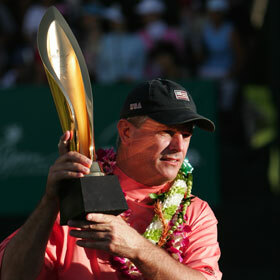 SONY OPEN » Paul Goydos shot a 3-under 67 yesterday to win the Sony Open in Hawaii -- his first title in nearly 11 years. Tadd, a teen sensation, golfs his way TO fame at the Sony Open. More troops with Hawaii ties were killed last year than during the previous two years combined. The voyaging canoe and its companion star in a gathering on the Big Island. The cosmos awaits discoverers on a night looking up with the Hawaiian Astronomical Society. The former substitute teacher is a winner again after so many years of plugging along. The UH quarterback can still pull his name off the NFL list. The state auditor reported that sick leave and overtime have soared among correctional officers at Hawaii's youth prison. Hawaii and the the rest of the country honors the memory of slain civil rights leader Martin Luther King Jr.